Aden started volunteering at the Friendship Inn about a year ago. She discovered the Friendship Inn when she came for a program. 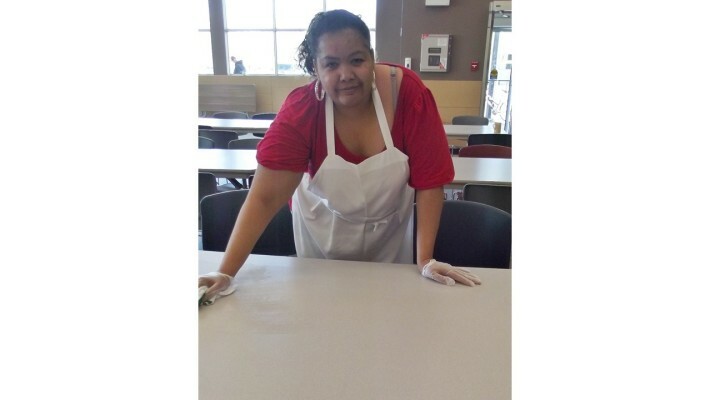 When she learned that the Inn served meals, her experience volunteering at soup kitchens over the past 18 years encouraged her to volunteer. Volunteering has had a great impact on Aden. “Volunteering helps me get outside myself,” she says. “I’m gaining more than I’m giving.” While her passion is for kids, she loves helping out in the kitchen at the Inn. Aden’s goal is to become financially stable enough to create supports for kids and family – a safe place for kids to be, affordable rental units – whatever she can do to help the kids that make her smile. I’m torn when I see kids at the Friendship Inn, they make me smile, but I’m sad that they are here because they are hungry. Limited by her health, Aden has not been volunteering as often lately, but today she dropped by for breakfast and decided to volunteer for a few hours, too. I’m glad she stopped in, it was a great chance to chat with a volunteer who has experienced what the Friendship Inn can offer beyond a meal.